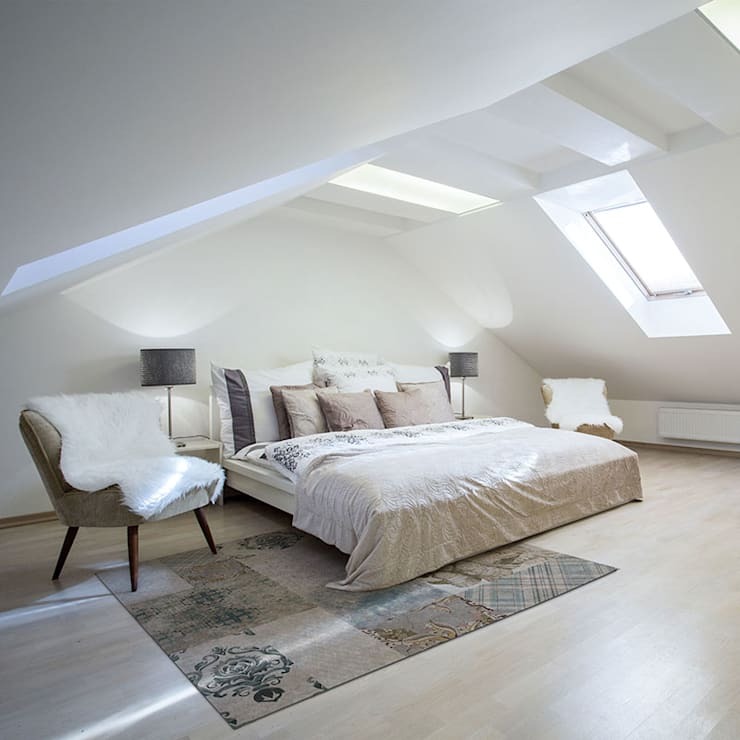 Cozy and charming, the attic is the space in the house where you can create the perfect environment whether you have refined taste or prefer a more rustic look. Either way, you can use it to create warmth and style in your home. With some beautiful furniture and a fresh coat of paint, the attic can be transformed for multiple uses, in whatever style you want from classic to the modern. You can also work with the specs available to you, making the most of even the darkest of corners and maximizing every square inch. Today at homify we have compiled a list of seven examples of attics, designed by internationally renowned architects and professionals. We hope they inspire you to transform your own home. 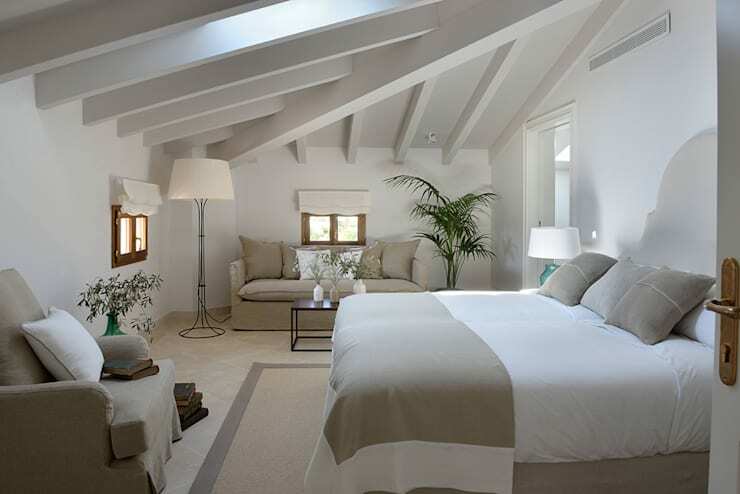 The attic environment often goes hand in hand with a rustic decorative style or a shabby chic design. In this image, we can see the romance that is inherent in the sloping beams and the warmth that resonates throughout the room thanks to the earthy tones and the cozy furniture. We can see how the designers have worked with natural light as well as white and beige tones, emphasizing the space available in the room. The gorgeous pot plants add a natural touch to the room, while the lamps ensure that there is mood and ambiance throughout this space. This is a very comfortable and stylish room that isn't in any way over the top. The ingredients of a living room are clear: classic and modern touches. In this attic, we come across a very refined and compelling living space that is worthy of the best city apartments. The furniture arrangement is simply ingenious, while the interior design is functional and trendy. The features of this space work with the size of the room, filling up corners and walls all in the right places. The blue/grey tones complement the light in this space while adding elegance to the room. There is also a very warm and welcoming touch thanks to the rug and the throws. 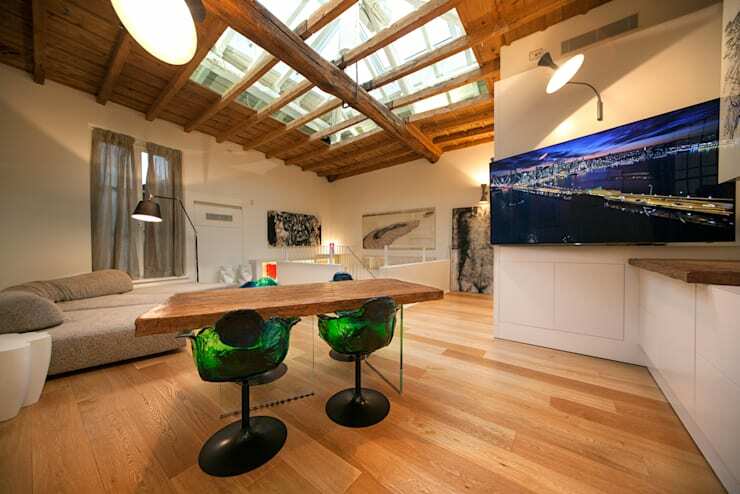 The skylights are very strategic, allowing light to fill this space so that it appears spacious and bright. 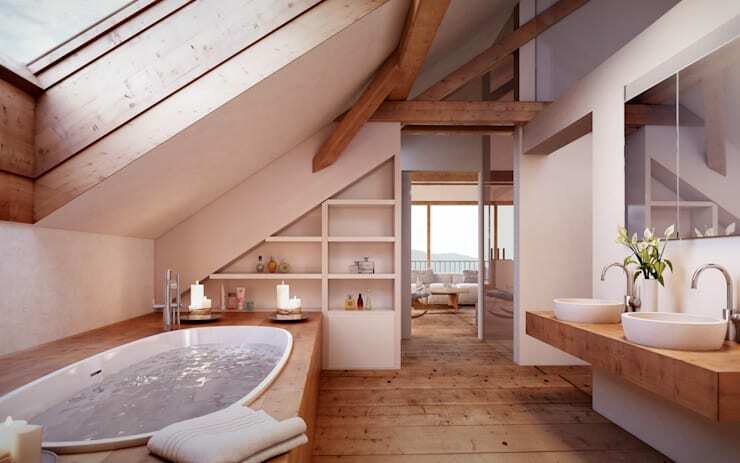 We now come to an attic that has a modern taste, where every detail has been carefully selected. It has been carefully designed as an open plan space that is sophisticated and classy. 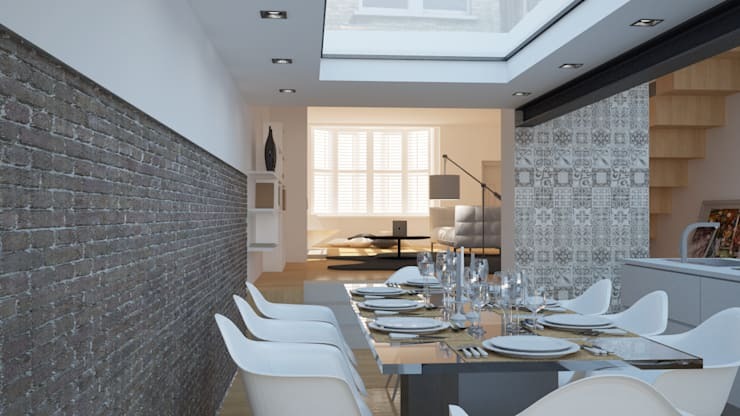 The patterned cement tiles are used as wall cladding, which are a distinguishing feature in this space that personalizes it and creates a very sober and neutral environment. The spaces all flow into one another here, creating a beautiful and uniform look and feel. How could you not be charmed by this beautiful bathroom with its solid wood base and rustic yet minimalist design? This attic has been turned into an incredibly romantic atmosphere that is country-chic with a modern allure. It is also characterized by high quality materials. The whole space works with creamy white tones and warm wood tones, with the exception of small, coloured accessories that don't distract from the original harmony. Ultra modern furnishings complement the space, pampering guests and providing maximum comfort. If we are looking for something different, an eclectic touch can create beauty and contrast in an attic space as we can see in this design. The fittings and features in this space bring colour and diversity to the room, alternating with the large wooden surfaces and the rustic undertones. There is also an industrial chic look and feel thanks to the steel used in this space, which works in harmony with the clean and contemporary lines and shapes. This is a room full of surprises! The keyword in this space is brightness. It is not only about the large skylights in the ceiling. 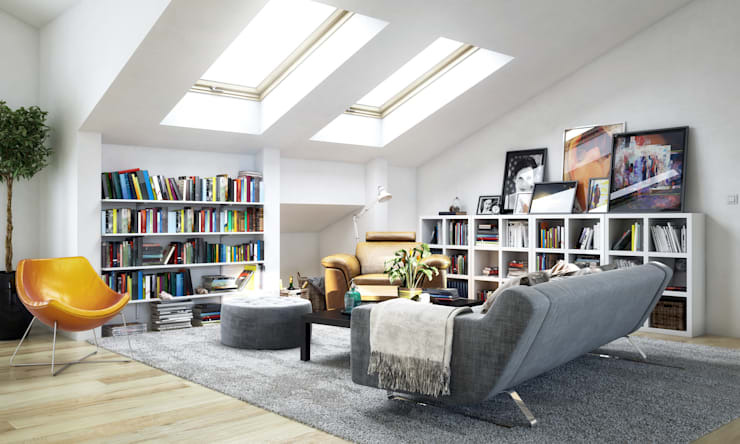 This attic appears brightly lit despite the fact that it's at the top of the house, which is usually the darkest room in the house. This is because the designers have gone for a predominantly white design, which is a very tactical tone to use in a small area that doesn't feature too many windows. This room is a wonderful example of how materials can make a huge difference in the design and decor of a space. The painted ceiling reflects the light that does come into this space, making it seem airy and spacious, which is further enhanced by the furniture chosen for this space. Have a look at these bright ideas that can cheer up rooms without windows. On the top level of this home, we come across an open-plan studio apartment like no other. Functionality and aesthetics are brought together in a delightful combination, with an underlying Scandinavian design. What more could you need? Everything is perfectly coordinated and arranged so that it is harmonious and homogeneous. The oval bed stands in the middle of the room, separating the bathroom from the bedroom. Don't you love the curves it offers this space? Personalize a room like this with good lighting and some decor touches that speak to who you are. Did you find this ideabook motivating?